I had some puff pastry left over and thought I'd use it up before it went out of date. I cut up some of it into strips, about 20 cm long and 2 cm wide, then twisted each strip and placed on a baking sheet lined with baking paper. I baked at gas mark 7 until the twirls were golden in colour. I saved one part of the puff pastry, put some grated cheese in it, folded two of the edges into the middle, then folded along the middle again. I sliced this flat roll into 1 cm wide pieces and placed lying down onto another baking sheet with baking paper. Both these were very tasty and I recommend they are served fresh before they've had a chance to cool down completely. Wash, peel and slice the carrots and parsnips. Place on a tray lined with aluminium foil, add the honey, thyme and oil and mix them round, so the carrots and parsnips get a good coating. Wash, peel and dice the potatoes, then steam for 10 minutes. Take out about a third of the potatoes and mix in with the carrots and parsnips. Leave the remainder of the potatoes to finish steaming. Place the tray with the vegetables under a medium-high grill, stirring occasionally, should the vegetables begin to burn. When the potatoes are ready, move them to a deep pot and blend them, adding the water gradually. At the end, add the vegeta and black pepper. 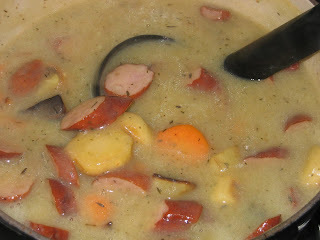 When the other vegetables are ready, add them along with the sausages to the soup and bring to the boil. This was quite nice and very filling. Well, when I saw the trout fillets in the shop, I just couldn't resist buying them, even though I'm not really a fish eating person. Not at all in fact. But during our visit to Bulgaria in August, we had freshly caught river trout, pan fried with mashed potatoes, so I thought I'd give it a go. And it definitely worked. I found this recipe for the trout and it sounded as good as it was simple. I actually made bread crumbs to use for the fish, rather than flour. I had some spuds left over from last week, so I steamed them to death and made Delia's perfect mashed potatoes. This is the second time I make this recipe and it was once again very delicious, despite that I swapped the crème fraîche with extra thick double cream. I think that this, combined with the potato variety (possibly Vivaldi), that made it rediculously sticky and shape-defying. I'd bought some runner beans especially for this, but sadly they were way past their best and turned out leathery and tough. What I worked out is that peeling the skins revealed a bright green and creamy innard, so all was not lost. 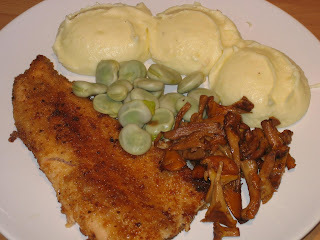 And once again I couldn't resist getting a couple of boxes of fresh chantrelles, which I just stewed in butter. All in all a very yummy meal, even if it looks a bit colourless in the photo. This is a definite repeat candidate. It even didn't take too long to do, so quite good for after work as well. 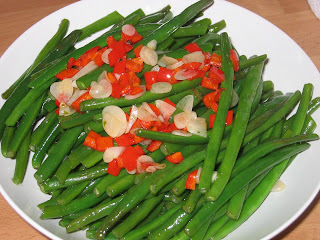 The other day we went to a nice Italian restaurant and some of the vegetables we had were French beans with chilli and garlic. So I tried it out today, to go with our barbecued lamb and turkey. I tried it out, I steamed the beans, then sautéd them along with the chopped red chilli and finely sliced garlic. Sadly I used walnut oil for this and it was a mistake, it didn't taste nice at all, though it wasn't completely inedible. I'll try this out with toasted sesame seed oil or butter next time. This concludes this busy, but highly enjoyable week-end. Well, I was reminded of this type of cake on my holiday at the beginning of August, I'd made it at uni and completely forgotten about it. Actually you could do the whole sponge in one go, I just did it in steps for the instructions. 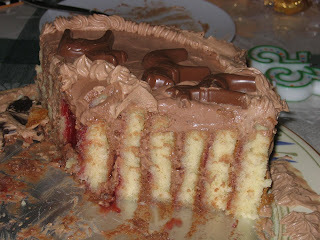 Mind you, it's quite messy, don't be tempted to lick your fingers! Now roll up the first strip. Note that on the last piece, I cut a wedge edge to form a smooth end. 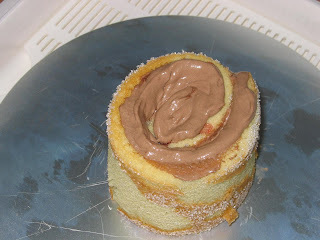 The left over Angel Delight, I piped in to the holes between the sponge strips and leveled out the top. In hindsight, I should have made a carton strip to use as template, because there was too much variation between the strips and I ended up using quite a lot of Angel Delight to level out the top. So I had none left for the sides. What I did was to whip extra thick double cream with some icing sugar. Then mixing in chocolate powder to get the same colour as the Angel Delight. I piped some to cover up the edges. 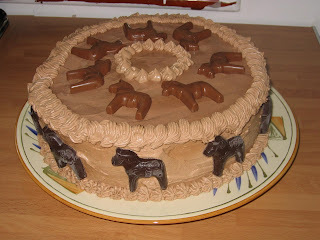 Also I had the chocolate Swedish horses (Dalahäst). Sadly the dark ones have a white surface here and there - the reason for this is that I stored them in the larder and that is a bit too warm for dark chocolate and this causes the fat to move to the surface of the chocolate, it hadn't gone bad in any way. I made most of the cake late last night and kept it in the fridge. The sponge soaked up some of the moisture from the jam and Angel delight. I really like moist cakes, I don't care much for the English type, they tend to be so very dry and with all the icing and marzipan on top, they are extremely sweet. But maybe that's a good thing, because you don't eat as much of them. Either way, I'll continue to make moist cakes. This was great fun making. Well, I ended up cooking and baking to midnight last night, but today was quite a success - everything got eaten. 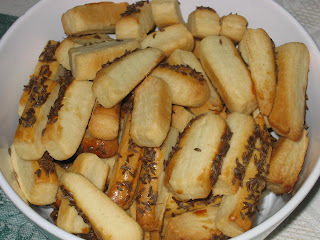 Still, here are the caraway bites I made after my break. This is a really cheety one, as I bought ready made short crust pastry. I hadn't realised that it was ready rolled, so I had to mash it up and re-roll, as these need to be a bit thicker, but that's all. I cut up in bite sized strips and brushed with the left-over egg from the garlic horns, then sprinkled caraway seeds on top and baked at gas mark 6 (200 degrees C) for 15 minutes. Here's the result, and despite I managed to burn the first lot, they all disappeared quite fast. Yesterday Sainsbury's had British strawberries. I guessed they are the last of the season and they looked rather nice, so I bought a couple of punnets. The plan was to eat some after dinner last night, but we forgot. Today as I was cooking, I got thinking about what they do in Sweden with lingonberries - they are sometimes layered with sugar, left to stand for a bit, then stirred and used together with game or Swedish meatballs. So I thought, this layering should work with the strawberries too, as I had a suspicion that they might not be too sweet. So in between watching the garlic horns baking, I diced the strawberries and layered them with granulated sugar. 1 punnet of 500 g with 3 tbsp of sugar. I stirred it in and left it on the side, while I prepared the dough for the broccoli pie. Some 20 minutes or so later, the strawberry bowl looked very nice, a lot of juice had been released and the pieces glimmered in the sun. So a scoop of dairy ice cream topped with these red jewels was mine and Lundulph's treat for today. Now I've had my break and will continue with the kyopoolu and the birthday cake. Hopefully will also have time to prepare some browned onion puree - a very useful ingredient for korma that I freeze portion wise. Dish number two is a savoury snack that I want to use as a nibble, instead of the usual crisps. 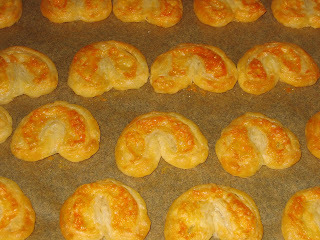 It's a very old Swedish recipe, my Mum used to make these a lot in the past. Even Lundulph tried one. If you are using butter, melt it. Add the milk, salt and garlic and heat up to just over finger temperature. If you are using fresh yeast, dissolve it in the liquid, if you are using dry yeast, mix it in the flour. Start adding the flour to the liquid and stir in to make a dough. I used my kitchen machine for this. The dough should not be soft, but if you can't incorporate all the flour, carefully add a little more milk. Leave to rise to double it's size at least. Sprinkle flour on a surface and on a rolling pin. 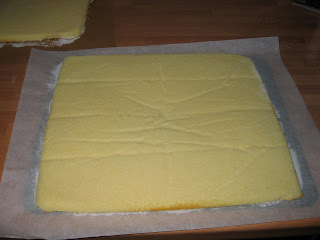 Divide the dough into 4 and roll each part to a circle, about 0.5 cm thick. With a sharp knife, cut the circle in 4, then each quarter into three wedges. Roll each wedge from the wide side up to the pointy edge. Place on a baking sheed with baking paper. Leave to rise for another 30 - 40 minutes covered under a tea towel. Preheat the oven at 225 degrees C (electric) or gas mark 6. Whisk up the egg lightly, then brush each carefully as not to let all the rising gases out. Sprinkle poppy and sesame seeds on top and bake in the middle of the oven for about 15 minutes. Take out and cover with a tea towel until the horns have cooled down a bit. They can be frozen and reheated in the microwave when needed. Quite tasty when eaten hot with butter. But oh so unhealthy. The name vitlöksgifflar consists of two parts: vitlök which means garlic and gifflar, which originates from the German word Gipfel, which means peak as in a mountain peak. I think they'd be called horns in English. 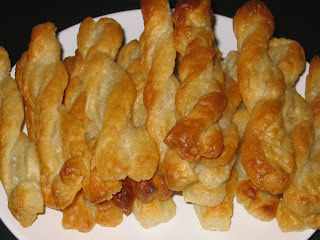 Not sure how they remind you of a mountain peak, but interestingly enough, a similar type of horns but from sweet kozunak-like pastry and filling made of rose hip marmalade is made in Bulgaria and they are called "kiffli" (кифли) and the word has the same origin. Today is a major cooking day, mainly because we're celebrating Lundulph's half past life tomorrow and the whole clan is turning up. Also I made up a new dessert on the fly. I'm half way through the day's tasks and thought I'd blog while having a break. The first thing I made today was to process fresh ginger with a little bit of water, fill up the ice cube trays and freeze. Each cube is about 1 tbsp in size, so making curries is very easy whith these. The big chore here is to peel all the ginger, I bought about 1 kg yesterday. On the other hand this'll last me for months. Place the beans and onions in a bowl and sprinkle the olive oil, vinegar, parsley and salt. The flavours usually come out better if you make this on the day before. Oil, vinegar and parsley should also really be to taste. If you don't like parsley, dill works just as well. If you feel that the red onions taste strong, I recommend that, after chopping, you sprinkle generously with salt and rub it in with your hand. Very quickly, the onions will release their liquid and begin to feel a bit softer. Rinse well over a sieve. This should take out the sharpness. Alternatively shallots or spring onions can be used. This is a traditional Bulgarian Winter salad, but I make it quite regularly throughout the year. Of course, since I'm expecting lots of people tomorrow, I used 3 cans of beans. We had a very lazy Sunday, to the point that I didn't make the planned satay turkey. I made it on Monday, but since it's quite a fiddly and time consuming thing to do, by the time it was ready we were so hungry, we ate like we'd never seen food before and then it was bedtime. Besides, it's not my recipe, it's Delia's but it's ever so good. It has nothing to do with the stuff they serve at restaurants, it's way beyond them and is worth the whole effort. I have yet to try out the recommendation to prepare the marinade and sauce in advance. I used turkey instead, as we had two packets of turkey steaks that I cut up in thin strips and didn't bother with the skewers at all. I was also a bit generous with the ginger and didn't have fresh chillies, so used crushed ones instead. Lundulph said finger-lickin' good. Oh, I also tried it out on the paneer I did the other day and it worked OK, would probably be better with tofu. I read about making paneer in another book, the recipe was slightly different there - use more lemon juice and 4 layers of cheese cloth and that really made the difference - the milk curdled a lot better and the cloth was strong enough to be squeezed out properly. The paneer is a lot firmer and I'm looking forward to cooking with it. Also I had to do a new batch of yogurt. The previous one was made from milk that I'd frozen before we went on holiday. And now I know that this is fine for cooking, but not for yogurt making. Never again, no, no. 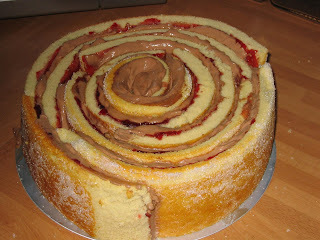 Yet one of those things that I haven't made in many years - Swiss roll. Today was not really good for making it, mainly since we're barely half way through the pear crumble, but I had eggs about to go out of date and there's already far too many eggs in the freezer. Line a shallowish baking tray (approx. 30 x 40 cm) with baking paper. If you're using an electric oven, preheat it at 250 degrees C. If you have hot air option, use that instead and preheat to 200 degrees. For gas ovens, gas mark 6. Whisk the eggs and the sugar white and fluffy, with an electric whisk, start on the lowest setting and gradually increase to maximum. The whole should take about 2 minutes. Mix the flour and the baking powder, then sift gradually into the egg-sugar mixture and whisk in on the lowest setting. Finally add the milk. Just whisk enough to get it incorporated. 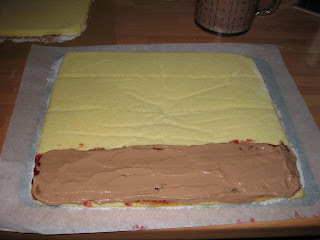 Pour out the mixture onto the tray, level out and make sure the mixture goes into the corners. Bake in the middle of the oven. For the electrical - 5 minutes only and keep an eye on it! In hot air/gas, bake for 8 - 10 minutes until it goes golden brown. Sprinkle some granulated sugar onto another baking sheet, take out the roll base and flip it onto the sugary paper. Immediately remove the paper it baked in. If it's a bit sticky, paint some water with a brush and try again. It'll still be hot and quite flexible, be careful so it doesn't rip. 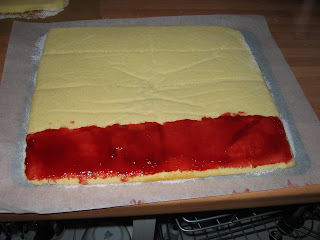 If you're using jam or custard as filling, spread it immediately and roll it up, place it so the edge is hidden at the bottom. Don't make too thick a spread or it'll be awkward to roll up. If you're using whipped cream, the bottom must be cold, so the cream doesn't melt. So cover the base with a tea towel and leave to cool. It is important to have smooth and thick jam/cream and not spread too much. I used almost a whole jar of the chunky quince jam I made last year and I did wonder if I should have whizzed it with the blender before spreading it and decided against it. So when I rolled it up, I got a large lump of jam in the middle, the whole roll became quite thick and the only thing holding it together is probably the gel-effect of the quinces. Last Friday I bought a new pie dish especially for making the lemon meringue pie that I've been hankering for in the last three weeks. But due to an extremely busy week-end, I still am planning to make the lemon meringue pie. In fact, I'll probably have to throw away the lemons, they are looking rather sad now. But on Saturday, my dear neighbour gave me some of the huge pears that both Lundulph and I have been longingly looking at - small tree with huge pears. Lundulph even dared to go and check to see if they are real, or some sort of decoration. Mix the porrige oats, flour and caster sugar with the margarine into crumbles. If it all comes together into one big lump, just add more flour and oats, until crumbles form. Peel and cut the pears into smallish pieces. Mix the caster sugar with the cinnamon. I put both in a jar, closed the lid and shook it for a bit. Also good to store in, if it's too much. Grease the pie dish and put the pear in it. Sprinkle generously with the sugar and cinnamon mix, stir the pears around so all pieces get a little of the mixture. Level out the pears and cover with the crumbles. Level out again, to make sure it'll bake evenly. Bake in a pre-heated oven at gas mark 6 (220 degrees C) for 30 minutes. Today we had the crumble with dairy ice cream and the pear flavour really came out. And idea for next time is to add chopped hazelnuts to the crumble. Now this recipe is slightly different from the apple crumble one from before. The reason for this is that I asked Lundulph to look in my old recipe book and what he found was the recipe I learned at school many years ago. It is also originally meant for apples, but these pears worked ever so nicely. The pie dish is 29 cm (12") diameter.